This month’s BATHROOOOOOM of the MONTH goes to Co. Restaurant. Not only do their pizzas get top marks, but their bathrooms top the charts this month with a pleasing combination of dark red subway tiles, random art (like a visual non sequitur) and fancy accessories (lemon scented hand soap from C.O. Bigelow). My favorite part was the paper towel cubby hole. Nice work, guys. For our full review of Co. Restaurant, please click here. Ever since I read Jim Lahey’s book, My Bread and baked many of the recipes, I’ve been a bit obsessed with Mr. Lahey. Nothing crazy – no stalkerish tendencies. Just a serious admiration for the man’s bread baking talent. I headed up to his restaurant Co. in Chelsea to sample his bread – and PIZZA – first hand. On a scale of 1-1,000, can you guess how excited I was? Place your bets in the comments section. Pushing away the velvet curtains at the front door reveals a delightfully warm, pizza-smelling atmosphere that fogs up the windows with bread-baking steam. All around me is friendly chatter – not too loud not too quiet. Perfect for either a friendly get together or a date. The attentive hostess greets me with an ETS (Estimated Time of Seating) – about 30 minutes, and I take a seat at the bar to await a friend. Caramel colored wood paneling graces the walls with an interjection of one mirrored panel leading to a window through which you can peep the wood burning oven. This same oven is projected on the wall above the tables like a movie screen – like one of those Yule Log DVDs. Customers have apparently asked to buy a copy of the recording, but it’s not for sale, as you can hear the owner cursing in the background if you listen closely. In my opinion, this only adds to its kitchy charm. First things first: BEER. I’ve been dying to try Kelso beer ever since I started following them around on Twitter. 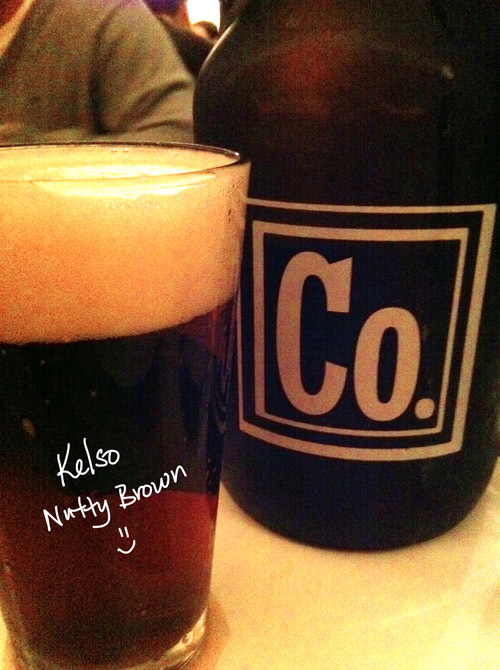 Luckily, Co. happens to serve Kelso Nut Brown Lager, which we promptly ordered a growler of (growler is a new term for me and basically means a helluva big jug o’ beer). We were very pleased – it complemented everything we ordered, especially the Popeye pizza (more on that below). We easily polished off that growler. Next up: The Cannellini Bean and the Chicken Liver Toasts. I LOVE chicken liver. You might remember me mentioning this around Thanksgiving time. It’s a weird thing to love, I know, but I really do. Co.’s version did not disappoint: pure perfection, whipped to a frosting-like consistency while still offering that signature tangy taste. As an added bonus, the spread was very generously applied. The cannelini beans were like a meat broth stew (minus the broth) – bean bolognese, if you will. And I did! And would do it again, please and thank you. We selected the Margherita and the Popeye pizzas. 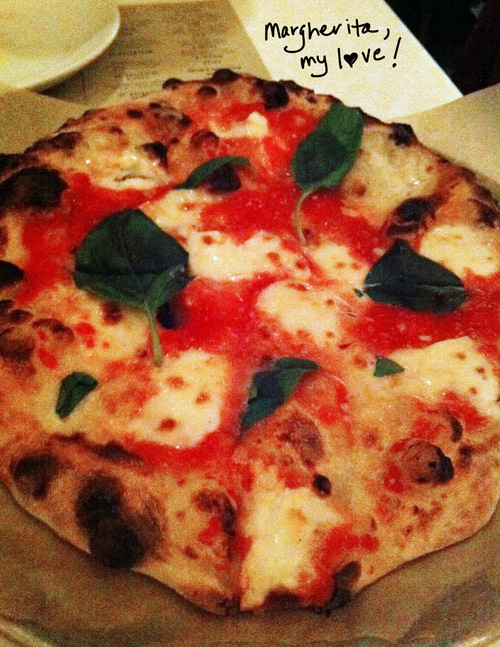 The Margherita was a perfect blend of tomato, mozzarella and parmesan with large basil leaves resting on top. The crust was crispy, charred and moist all at the same time, and the mozzarella had flavor – actual flavor all its own! I dubbed it King Pizza of the night. 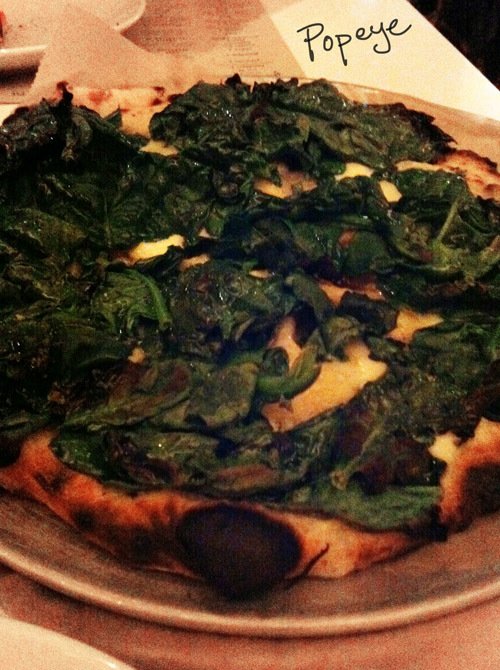 The Popeye (pecorino, gruyère, mozzarella, spinach, black pepper and garlic) was a study in delicious contradiction. The spinach, both crispy and tender, was a perfect balance to the tangy and gooey gruyere. For added fun, the spinach seemed to have been marinated in oil and garlic. And they have sundaes! I enjoyed a vanilla and salted peanut topped with caramel sauce, cream and pomegranate seeds. I was happy to find the bathrooms as orderly and well-constructed as the pizza (yes, I know that’s a weird thing to say). Clean, modern and supplied with fun extras like C.O. Bigelow lemon-scented hand soap and ART (that’s a crab in the framed photo).